I’m not going to lie – it was pretty freaking awesome to have all of last week off. However, having to go to work today? Totally blows. I wish my company was closed in observance of the first day of rifle hunting here in Pa. That would have been super fantastic. Because I’d still be in my pj’s just finishing up the last swig of coffee and getting ready to bring down all the Christmas decor. Sigh. Now, onto the real reason for my post! 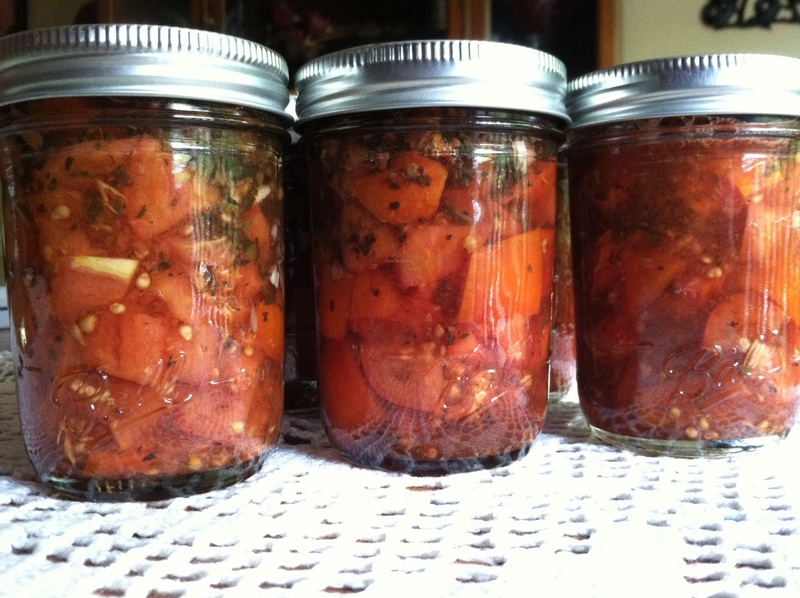 Food Preservation – when people think of food preservation they think about their great grandparents and grandparents. They did it because times were tough and it helped to save money. It was a great way to feed their – at many times – very large families. They did it because it was part of their immigrant heritage – their mothers did it, so they too carried on the tradition. My bubba was a canner. She’d preserve the fruits and veggies from my pap’s well taken care of, high yielding garden. Sadly, I never got to see this part of her life because when she passed away, I was 7 and she was 92. Her canning days were behind her. My gram never canned or preserved food, therefore my mom never did. Which means I was never introduced to it. But I got into it because I like to think because it is in my blood, part of my DNA. But the real truth it that I got bored with traditional cooking and needed a challenge. I needed something different. I was already creative in the kitchen, trying new recipes and being adventurous. But food preservation? That was something totally different. There was a science to it. And the thought of having shelves full of beautiful mason jars filled with foods I had preserved was very appealing to me. But I wasn’t sure it was something that would stick for me as a hobby so I did a test before I committed to purchasing all the stuff you’d need. I made a batch of strawberry jam. That first batch of jam? It was delicious. It was sweet, it was simple, it was easy to make. And I was in love with the fact that I could recite all of the ingredients that were in it, without having to look at a label. The idea of simple preserved foods made a home in my head, and my heart. The following year, we planted a garden. I gave in, knowing I was hooked and purchased more mason jars, a canning pot, and a pressure canner because hubs wanted to can deer meat. I tried my hand at pickles, pickled peppers, and canned tomatoes. I made a batch of Apple Pie Jam. Tomato Butter. Simple things that could be processed in a water bath canner. Only enough to take up just one shelf in the basement food storage shelves. The pressure canner sat for almost a year, unused while I attempted to get over my irrational fear of it exploding and blasting me in the face with molten hot deer meat and shards of glass. 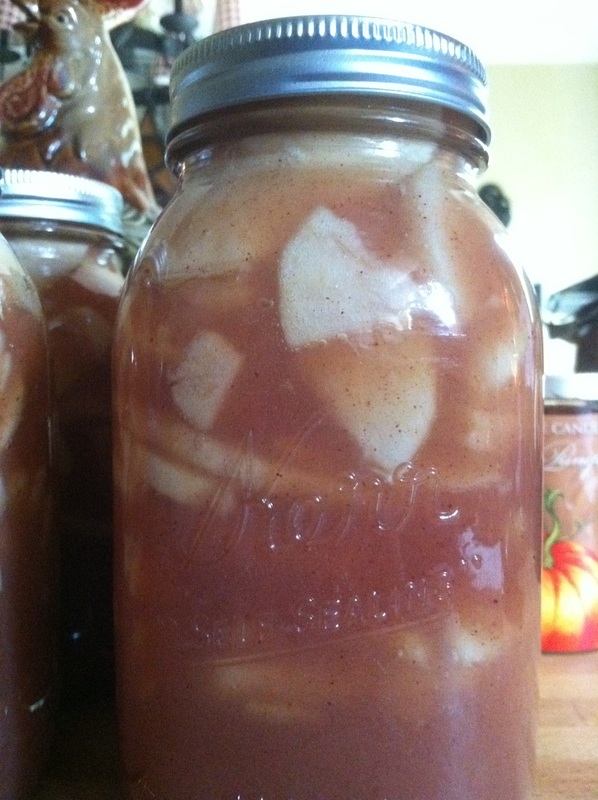 The hubs used it the first time around January 2012 to cold pack a few jars of deer meat. It didn’t explode. 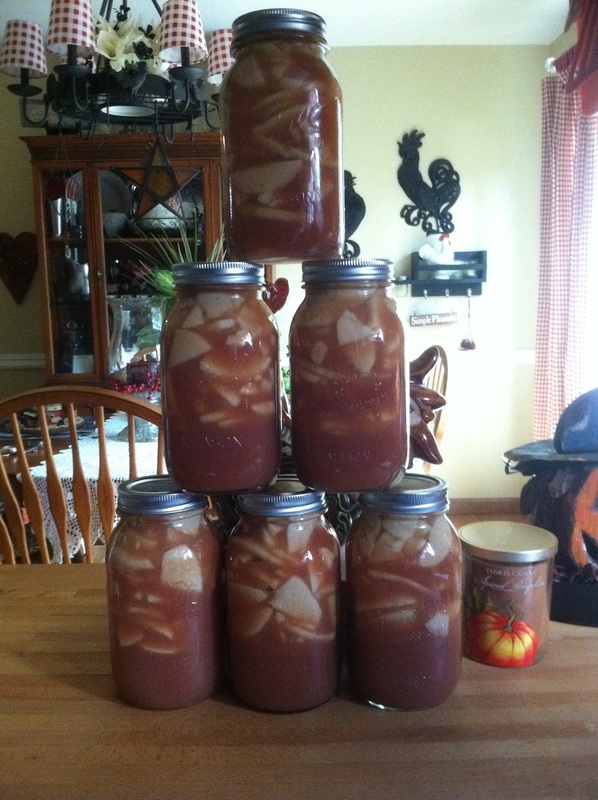 I got over my fear and jumped into canning a whole 23qt canner full of jars of deer meat. I survived. I was in deep. 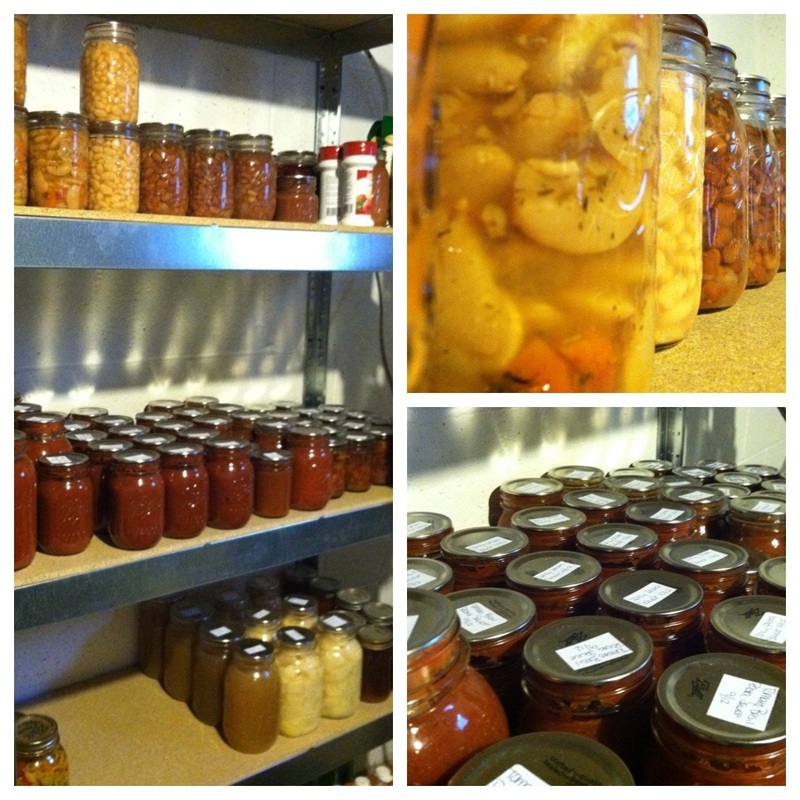 This year, I went balls out on canning – take no prisoners. I canned 100+ jars of stuff, a variety – pasta sauce (tomato basil and spicy tomato), tomato jam, bruschetta mix, strawberry jam, apple pie jam, pinto beans, cannellini beans, greek style butter beans, potatoes, and my very first batch of chicken stock. And I’m not done. 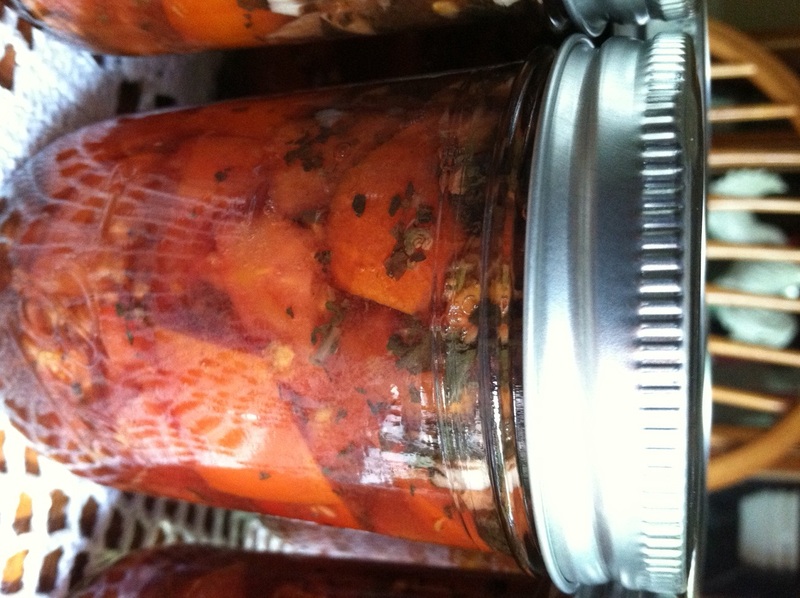 I plan on canning another canner full of deer meat with some potatoes and carrots for a kind of hunters stew. I want to do more potatoes because it’s lovely being able to pop open a jar and have almost instant home fries for breakfast. I’m going to can ground beef so we can have quick nachos, or chili. That Thanksgiving turkey carcass will be turned into turkey stock (I’ll have an upcoming post on how to make this soon!) This is just the tip of the iceberg for me. Now, onto WHY I can and preserve. It’s for a variety of reasons, none of which have to do with the zombie apocalypse. Yes, I’m obsessed with all things zombie, but I’m not preserving mass quantities of food because of some potential viral outbreak that turns us into brain eating undead. I do it because it’s cheaper than purchasing it from the grocery store – I even beat the discount stores. But I’d still can even if doing it myself wasn’t cheaper. Because – onto the second reason I can – canning my own food means I have control over what is going into my body. I can recite the exact ingredients that went into all of those items I listed earlier, because the list of ingredients is small. I am canning veggies from my own garden, as well as local farms. For a little investment of my time, I can fill shelves with food that has no preservatives, except maybe a little salt, vinegar or lemon juice. 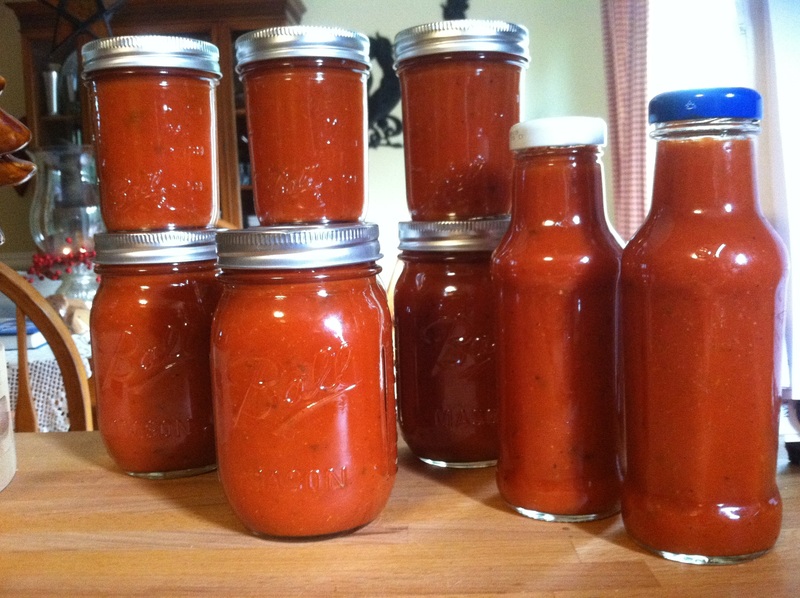 I can take that surplus from our garden and turn it into pasta sauce that we can eat and share for a whole year. The third reason I can? Because I enjoy it. I love cooking. You have got to love cooking in order to be a food preserver. It is time consuming, and it can get hectic, because you have to process the veggies and fruits when they are ready. They do not wait until it is convenient for you. My August and September each year are now pretty much consumed with canning and freezing. That means the house is a mess, because between work and canning there is certainly no time for things like running the sweeper or dusting. The laundry gets done sporadically. I force myself to clean the bathrooms because well, they’re bathrooms and they get gross. And at times I do get frazzled and feel overwhelmed because I am living and breathing food preservation. After work, on the weekends. Yep, I live and breathe it for those 2 months. This year, when I was all done, I wiped the sweat from my brow and said whew! All done till next year! And then a couple weekends later, I canned potatoes. In the coming weeks I’ll can that deer meat “stew”. Why? Because I had a breather from Canapalooza 2012 and I want my new canning shelf to be FULL of jars, no empty spaces. And because I love to cook. And the last reason why I can? It’s kind of a side effect, but I want to inspire other people, both young and old to start canning or to restart canning. To be more mindful of what they are eating. I am only 32, and people are always surprised that someone so young is so deeply interested in something as old fashioned as canning. Hearing people say that makes me smile. My own mom wanted me to teach her to can before she passed away, because she loved the thought of controlling her food. And it would give her a hobby. If I can inspire just one person to take up canning from my talking about, or gifting them something I’ve made, it makes this whole food love/food preservation experience even more worthwhile. Mmm, Apple Pie. One of the best sweet comfort foods out there. But it does require some preparation and time to make a pie from scratch. So, why not can some of the Autumn apple harvest and make Apple Pie Filling? It’s worth the effort! 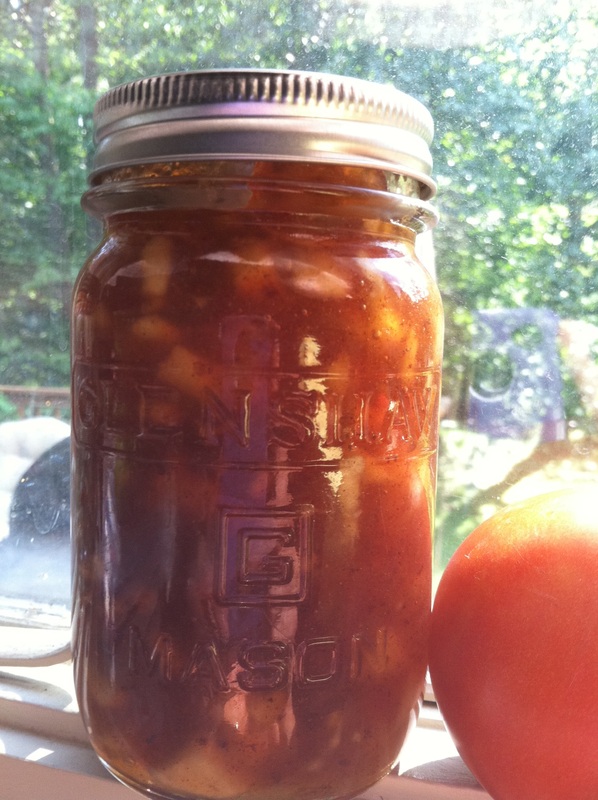 Now, the Ball canning recipe calls for the use of Clear Jel to thicken the filling, as cornstarch is not always stable enough to withstand the required canning time as well as may not let the heat penetrate the apple filling to properly heat it. The Tasty Kitchen recipe calls for plain old cornstarch. That being said, I use plain old cornstarch to thicken my filling, and have not had any problems on either recipe. Clear Jel is not readily available in my area so I substituted the cornstarch and had lovely results. Whatever you use, do so at your discretion. I recommend following the directions and using the Clear Jel, even though I myself don’t follow the directions. Just make sure to keep the filling very hot and to have your water bath already at a boil when you add the jars to minimize any issue. And lastly, enjoy the preserving process! The links below will take you to 2 different recipes. I have tried both and think they are both awesome, however I add more cinnamon than called for as well as some nutmeg. Do NOT deviate from the amount of lemon juice called out! There is a certain big named company that has been producing ketchup for like, ever in my neck of the woods. But they better look out. Because there is a new kid in town. Busting out some ketchup that also starts with an H – Heather’s Ketchup. Ya. I said it. Now that we got all that out of the way, this recipe is a fabulous way to use up the very last of your garden tomatoes. My tomatoes are starting to look a little sad and are either splitting, falling off the vines before they’re ripe, or being pilfered by the local bugs. So, I went through the garden and was able to save enough of the Roma’s to make this ketchup. You can use whatever type of tomatoes you like, but if using something like the”Big Boy” variety, your cooking time will be longer since they have a lot of water and seedy pulp. This took me about 2hrs total to make this and since I got such a large yield it was worth every second! This recipe yielded me with 3 small ketchup sized jars, 3 jelly jars, and 4 pint mason jars. So, it’s a lot of ketchup. But it keeps well and will be a great item to gift at the holidays or just enjoy next summer! In a large stock pot, add olive oil and all the ingredients through to the jalapeno pepper. Cook over medium to low heat, stirring occasionally, until onions have softened and browned. Stir in the water and tomatoes. 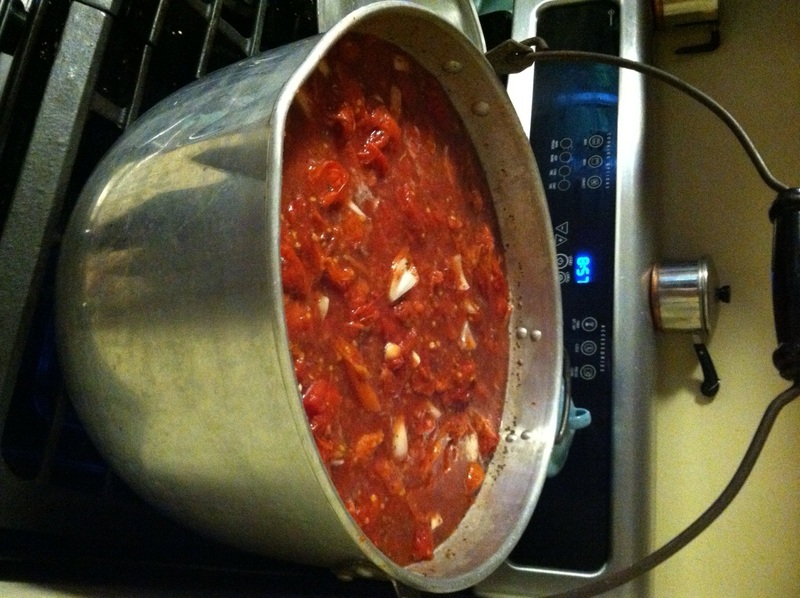 Bring to a boil, reduce to a simmer, and continue to cook until tomatoes have reduced by half. Add in white vinegar and brown sugar and simmer until the sauce reduces to a thicker version. Taste and add additional seasonings as needed. 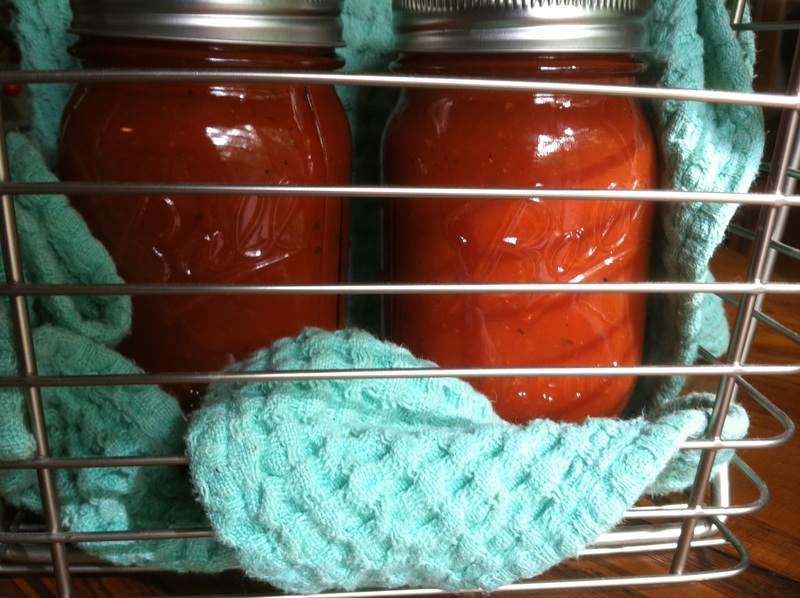 To preserve, process sterilized hot mason jars in a water bath canner for 10 minutes, letting cool and seal overnight. Check jars for sealing, if any jars have not sealed they can be put in the fridge to use! Note: this ketchup will NOT be thick like what you are used to seeing in the stores. It’s thicker than tomato sauce, but not as thick as Heinz or Hunts. If you feel like you must have it be thick like those versions, make a cornstarch slurry and add it in tablespoon increments until you reach your achieved thickness. I love fall. It’s one of my favorite seasons. The leaves change. The air takes on that crisp earthy smell. You can truly enjoy sitting around a campfire. It’s the start of soup/stew/chili Sundays at my house. And fall flavors – pumpkin, apple, spice. Yummo. In comes this recipe. It’s so easy to make. It’s fall in a mason jar. It’s fabulous on a piece of warm crusty bread. It’s sinfully good in yogurt or cottage cheese. It can become an appetizer by mixing one jar of with some room temp cream cheese and spreading it on whole grain crackers. Drool. 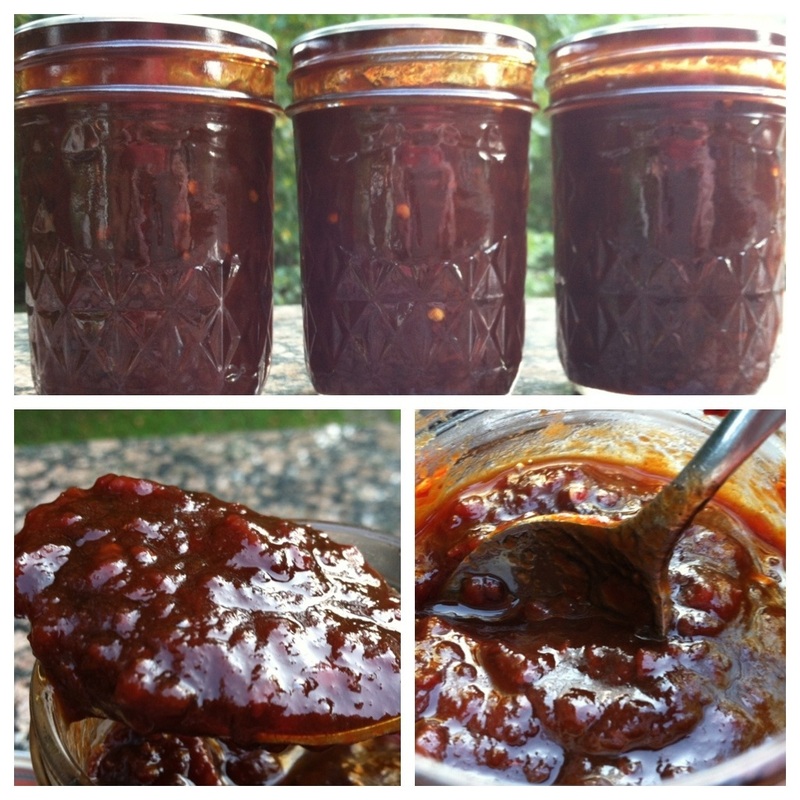 For those of you new to canning, this is a great recipe to start with because jams are so simple and have a soft “set”, which means they are not firmly jelled like jellies, but are a soft set which makes them what I call runny in comparison. And this doesn’t require any special equipment other than canning jars. You can water batch can them in your stock pot lined with a piece of foil on the bottom (this keeps the jars from bouncing around and possible cracking). Cook apples, water, lemon juice and butter over low heat, stirring until apples are soft – avoid letting them get mushy! You don’t want applesauce. Stir in ONE box pectin and bring to a full rolling boil, stirring constantly. Add the sugars and cinnamon and bring back to a boil, stirring constantly, for one minute. Remove from heat and skim off foam (there may not be any). If you feel the jam is not thick enough for your taste, add the other box pectin. Add half to start, and then if it is still not thick enough, add the last of the second box and stir. Pour into hot sterilized jelly jars, leaving ¼ in headspace. Wipe rims of jars with a clean damp cloth. Place canning lid and band on till finger tight. Process jars in a boiling water bath for 10 minutes. Remove from pot carefully, the jam will be very hot! Place on counter overnight to allow jars to cool and seal. In the morning, test the lids – they should not make any noise when you press on them. If they move (they’re not sucked in and indented) just put that jar of jam in the fridge and enjoy! Makes 5-7 jelly jars worth. Note: I generally have to use 2 whole boxes of pectin when I make this. Otherwise the jam is super runny, more like a sauce than a jam with only one. This will all depend upon the types of apples you use and the pectin itself. I recently just made this and could have gotten away with using only 1 1/2 boxes but I used both completely and it was a little thicker than i’d have liked. Use your best judgement.